"This recipe is not difficult to make, even though it has quite a number of ingredients. It's a great party appetizer. This recipe can be found in my cookbook "From Uncle Bill's Kitchen"." In a mixing bowl, mix together yogurt, salt, small jalapeno pepper, and 3 tablespoons chopped parsley. Set dipping sauce aside. Soak bread slices in water for 3 minutes. Remove from water, and squeeze out excess moisture. Crumble into a large bowl. Mix in eggs and Worcestershire sauce. Mix in dried bread crumbs, fried onions, garlic, ginger, ground cumin, crushed coriander seed, 4 tablespoons parsley, and large jalapeno pepper. Add ground beef, and work in with your hands until well mixed. Roll mixture into balls the size of walnuts. Heat 3 cups of oil in a large, deep, heavy bottomed frying pan until piping hot, about 375 degrees F (190 degrees C). Cook meatballs a few at a time in hot oil until brown and crispy, about 3 to 4 minutes. To check for doneness, cut one in half to see if cooked through; it should be cooked in the center. Remove from oil using a slotted spoon, and place on a plate lined with paper towels to drain. 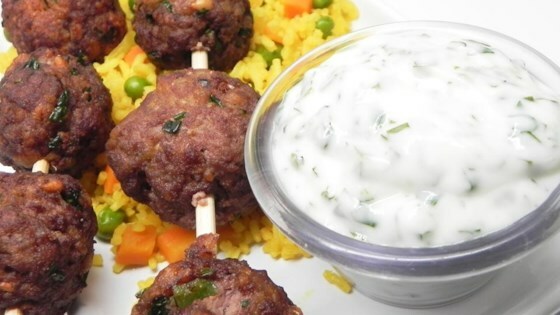 Insert a toothpick into each meatball for serving and dipping. Serve hot or cold with dipping sauce. We served this with rice and it was great. The taste was a bit different, but we loved it by the second or third bite. The sauce is key. Not sure why it's called Kabobs and not Meatballs. Very good recipe. The meatballs are good hot or cold and the dipping sauce is quite good, too. These are a good way to change things up with your appetizers. They are different and very delicious. I can't wait to serve them at our 'Final Four' party.